English is not perfect, but available in all pages. ** ** 蔵王と城と茂吉のふるさと、かみのやまの伝統行事「カセ鳥」保存会のページへようこそ。2019年のカセ鳥は２月11日(月・祝)に開催されます。ご期待ください。 ** ** Thank you for visiting "Kase-dori" homepage. 2019's Kase-Dori will be carried on Monday, 11. 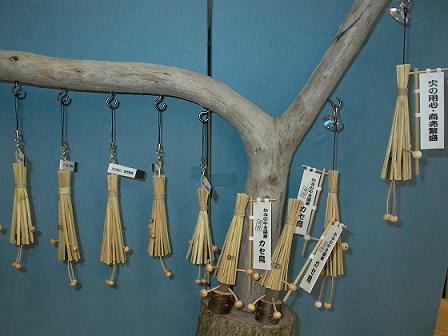 Feb.
a complete guide to the "Kase-Dori" festival held in Kaminoyama-city, Yamagata-pref. 2017's Kase-Dori was completed on Saturday, 11. Feb.
2016's Kase-Dori was completed on Thursday, 11. Feb.
2015's Kase-Dori was completed on Wednesday, 11. Feb.
2014's Kase-Dori was completed on Monday, 11. Feb.
2013's Kase-Dori was completed on Monday, 11. Feb.
2011's Kase-Dori was completed on Saturday, 11. Feb.
2011's Kase-Dori was completed on Friday, 11. Feb.
2006's Kase-Dori was completed on Saturday, 11. Feb.
2005's Kase-Dori was completed on Friday, 11. Feb.
2004's Kase-Dori was completed on Wednesday, 11 Feb. Mobile camera page has been opened. see the site. 2003's Kase-Dori was completed on Tuesday, 11 Feb. Flash photos (for PC) are available. 2002's Kase-Dori was completed on Monday, 11 Feb.
2001's Kase-Dori was completed on Sunday, 11 Feb.
Kase-Dori 2000 was finished in 11 Feb. Flash movie and photos are available. 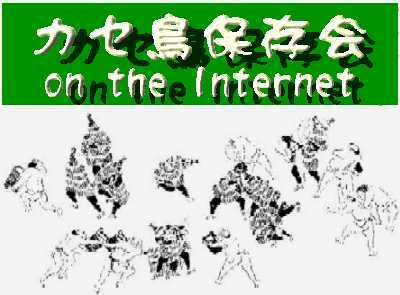 Copyright (C) 2000 Yamagata Broadcasting Co.Ltd. RealPlayer(Basic) or RealPlayer Plus is required. 1999's Kase-Dori photos are here. 1998's Kase-Dori photos are here. 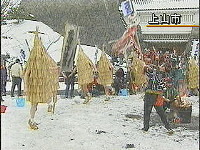 All Kase-Doris stand around a fire, and pray for success of the festival. Spectators pour water on Kase-Doris, and pray fire prevention.